Back in June, Silicon Valley startup Lytro announced it was working on a consumer light-field camera, using a technology that captures 3D light. Among the amazing-sounding benefits: It lets you focus blurry pictures or change the depth of focus after you’ve shot them. At the time, the company showed off photos and talked technology, but didn’t release any real details about the camera itself. Now it has, at a San Francisco press event led by Lytro founder Ren Ng. That’s him showing off his brainchild in the photo I took above. As you can see, the Lytro camera looks more like a postmodern flashlight or a high-end kaleidoscope than a garden-variety point-and-shoot. It’s a skinny rectangle with almost no controls–just a square touchscreen for composing and viewing pictures, a shutter button, and a strip that lets you zoom. The specs don’t sound like normal camera specs, either. It has an F/2 lens which lets in so much light that the camera doesn’t have a flash; Ng says it takes great photos in low light. There’s an 8X zoom. The memory and battery are built-in, not removable. Lytro’s camera will come with Web-based and Mac software that lets you edit the photos, including focusing and refocusing them, as well as share them in a form that lets the folks who view them play around with focus even further. Photos are stored in a new format that no current editing application supports, but you can convert them to JPG; if you do, you’ll lose the ability to refocus. As for price, the camera will come in a $399 model with 8GB (good for 350 photos) and a $499 16GB one (750) photos. That’s not an impulse purchase, but it does put it within reach of a fairly large number of interested people. The company is taking preorders starting today, but will miss the holiday season: The camera is supposed to ship in early 2012. 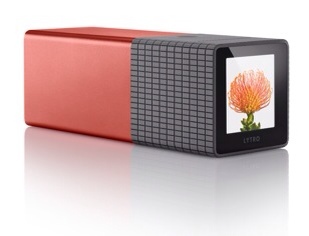 I’m still sorting out what I think about Lytro and won’t really know until I can take some photos myself. The technology is remarkable and should turn some photos that would have been lousy into keepers, but it’s not clear to me whether the very best pictures it’s capable of capturing rival or exceed the ones you can take with a more boring $399 camera if you know what you’re doing. Other than the technology itself, what’s most striking to me about Lytro is how little it resembles other cameras: Its goals are just utterly different from anything else on the market. That, and the emphasis on science, simplicity, and striking industrial design do remind me of one camera I’ve thought a lot about recently: Polaroid’s SX-70. (There’s Polaroid founder Edwin Land brandishing his invention at a Polaroid launch event.) It’ll be fascinating to see whether Lytro, like SX-70, is an astonishing product that doesn’t change everything forever–or whether we’re about to witness the dawn of a new era for photography. I'm not saying that compacts can't take good pictures, just that the lens on this one doesn't appear to be anything special. I'd be more interested in the sensor size. In good light, most of my photos are nice and sharp. In bad light, they’re often awful–so one of the things I’m most interested in is the Lytro’s low-light capability. Just to let you know that having a camera aperture (which determines the amount of light that hits the sensor) of F2 is not a big selling point of this camera, as many point and shots (eg Canon S95) have this aperture. Even at this relatively low aperture, in quite low light situations a flash is still essential for decent photos. That is why point and shoots still have a flash. The reason I think that a flash wouldn't work with the Lytro is for two reasons. Firstly, the amount of illumination from flash varies greatly with distance. This would make it difficult to select a different focus point in a picture after capture and get a good exposure. Secondly, the amount of flash that is emitted from the camera depends on the distance to what is being focused on. This would again cause problems if a different focal plane was selected during post processing. I also think that is disingenuous for them to say that they don't know how many megapixels the camera is. Wouldn't it be better for them to just be honest. To me, Lytro solves the three problems that cause most lost shots: light, delay and focus. Low light: The f2 rating is through the whole range of the 8x optical zoom — not true of the S95, nor (m)any other traditional camera lenses. But the sensor is also supposed to be better at low light, so it should be better than the s95 even zoomed out. Delay: waiting for your camera to autofocus on the right thing is frustrating and means missing some great shots. Focus: When you're taking action or nature shots, not only do you not have time to wait for autofocus, but the camera often guesses wrong at what you wanted to shoot. You must not have kids. Half the shots of them I have are slightly out of focus. Kids and pets move FAST. This technology will in no way help with out of focus pictures due to fast moving subjects, it is only relevant if you have focused on the wrong subject. All you need to do to fix out of focus pictures due to fast moving kids is to manually increase the shutter speed (read the manual for details). Perhaps even try the sport mode on your camera. I want to know how large of a print can this camera produce without losing quality? What sort of battery life does it have? Is it rechargeable? Are parts replaceable or upgradeable? Such as the flash drive? lens? etc. I'm highly optimistic about this camera. Even today's "point and shoot" cameras are gadgets with a lot of complexity for the user, and a lot of settings and things that can go wrong when taking a shot. The Lytro promises to move all that complexity out of the picture, so to speak, and let you concentrate only on composing the image that you want to capture. I'd heard about light-field technology for a while, but I assumed if it ever appeared in any commercial product it would be merely another feature bullet-point on an otherwise conventional camera. Instead it looks like Ng took the opportunity to re-imagine the relationship between the camera and its user. That's the kind of innovation I have to admire. And yes, I also thought of parallels with the SX-70. For point and shooters, this will pretty much fix back and front focusing, besides being able to take one picture and produce several with different points of focus. Maybe this won't revolutionize photography, but it sounds like a lot of fun to me. Interesting technology this is suitable for children who like to take pictures from time to time. So… 8 gigabyte (8192 megabyte) for 350 photos would mean that photos are stored in 23 megabyte files, no? A bit less, maybe… but that would suggest a relatively high megapixel rate. I wonder if this wonderful looking camera will help me take better photos of moving people. I like to capture sporting moments that my son has in school to keep as memory, but most of the time he comes out in the photos as a blurred mess!